The times are changing. We no longer live in a world that is going to be primarily governed by systems based on greed. We are very gradually, in a very subtle way, transitioning into an era that is going to be governed by higher states of consciousness. An era in which humans beings shall not consider each other as separate individuals, rather they shall see each other as a collective whole. An era in which we shall not be driven by our selfish desires, rather we shall become capable of putting others first. An era that shall not consider the world made up of machines, rather it shall consider the world as a very much interconnected living system. And our kids are at the forefront if this revolution. Somehow, they are blessed with this power of seeing and they have this capability of breaking through the older ways to lead the emergence of the new ones. Our job, as adults, is to simply allow them to lead us, and to not distract them by imposing our older ways of living. ‘प्रश्न विकास का 2.0- A space to facilitate Transitions!’ is a workshop very carefully designed for our kids wherein an attempt would be made to create a space that can facilitate our younger ones to go deep within, connect with their own selves and the world around, and evolve to a state of mind that promises to lead humanity into a connected future. The workshop is offered to the kids who have previously attended ‘प्रश्न विकास का- A Dialogue on Rural Development’ and who very well understand the advantages and disadvantages of the present Governments, Markets and Self-reliance based systems. This is about a shift in perspective. A perspective that no longer considers living beings, including humans, animals and plants, as machines; rather, it sees them as a web of relationships, networks and patterns, deeply interconnected and thriving as a whole. This change in our narrative shall fundamentally change the way we live on our planet. The present economic system is fundamentally established on Scarcity, with an assumption that scarcity provides ‘value’ to our medium of exchange i.e. Currency. This inbuilt scarcity based system is sucking our life energy from within. It is making all of us to work hard endlessly, consume mindlessly and play out our negative tendencies (Greed, Fear, Hatred, Anger etc) unnecessarily. This system needs to be transformed into a system that respects abundance, promotes abundance and thrives on positive human traits such as Compassion, Empathy and Love; a system that prefers collective happiness over personal profit. At societal level, too much accumulation is a sign of insecurity, whereas sharing is a sign of trust. This shift represents a change in the way we live with each other as a society. This is a shift at the level of Mind. This is a shift that a seeker on this journey has to lead for himself/herself. This shift shall open the way for above shifts to happen. 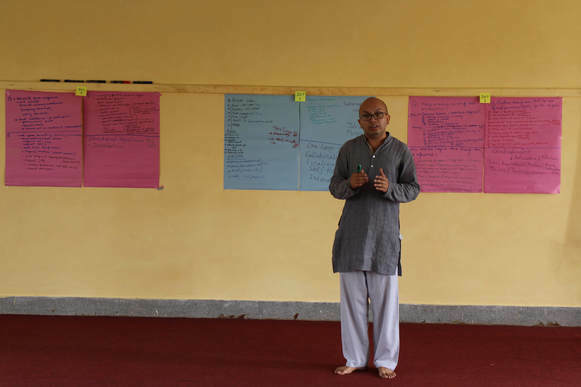 The workshop shall include various experiential sessions, simulations, meditation, field visits and documentaries. It shall be organized in a very spiritual environment of Deer Park Institute in Bir, Himachal Pradesh. 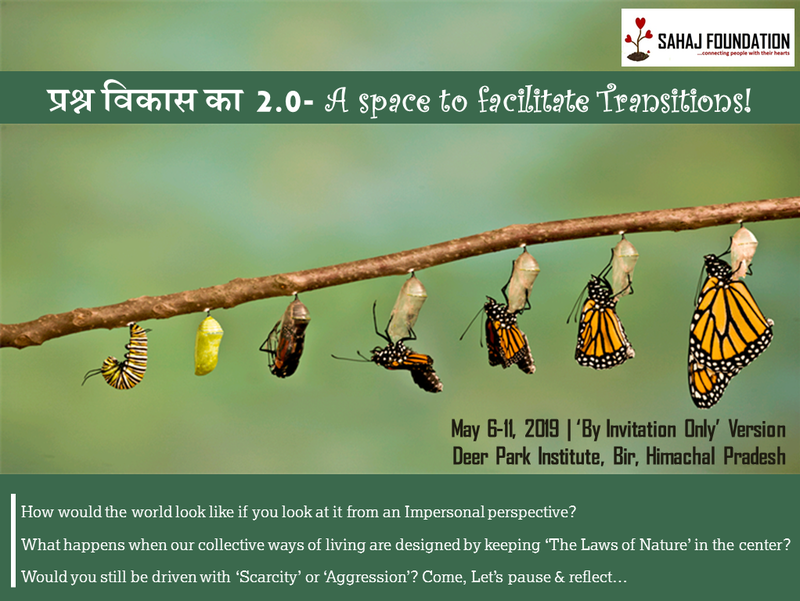 By the end of the workshop, the participants shall be able to look at their world with a different perspective, understand its inter-connectedness, find ways to lead their own lives as per the laws of nature and inspire everyone in the whole process of living. Deer Park Institute is a centre for study of classical Indian wisdom traditions. Established in March 2006 on the campus of a former Buddhist monastic institute, it is a project under Siddhartha's Intent Society. The core vision of the Institute is to re-create the spirit of Nalanda, a great university of ancient India in which all traditions of Buddhism were studied and practiced, alongside other schools of classical Indian philosophy, arts and sciences. More information on the institute can be found on its website. Road: Direct Volvo bus service from New Delhi to Bir. Rail: First train from New Delhi to Pathankot; Second train from Pathankot to Bir. Air: Flight from New Delhi to Dharamshala; Taxi for Deer Park Institute (65 Kms). Rs 7,500 per participant. The cost covers program charges, basic dormitory accommodation, food and local travel expenses during the worshop. Note: Interested Participants shall have to submit a non-refundable deposit of Rs 3,000 each in order to secure their space. The remaining contribution (Rs 4,500) may be submitted during the course of the workshop.